Michael Rye is a trial lawyer of more than 20 years’ experience whose varied intellectual property litigation practice runs the gamut of litigation from injunction hearings through appeal for domestic and international clients in a wide variety of industries, which often involve complex technologies. Mike’s client-oriented case management style is practical and productive. His command of the legal process involves understanding the written rules and procedures as well as the unwritten rules. He has a proven ability to solve complex legal problems through strategic planning and preparation. Mike’s practice emphasizes patent litigation, but often involves trademark, trade dress, copyright, trade secrets, unfair competition, false advertising, licensing, and other related commercial and business litigation. 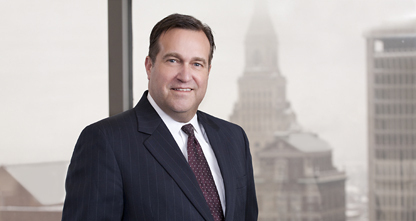 Mike has acted as lead litigation counsel in courts throughout the United States, including multi-district litigation and numerous Federal District courts. He co-chairs Cantor Colburn's Litigation Department. OFS Fitel LLC et al (Dist. CT) Represented a leading manufacturer of optical fibre in a complex patent infringement suit involving more than ten patents. After considerable discovery, we were able to negotiate a substantial settlement. FARO v. Brainlabs (Dist. CT) Represented inventor of surgical digital positioning devices. Negotiated successful licensing program with Brainlabs and other industry leaders after discovery conducted. Siemon Company v. Krone, Inc. (Dist. CT) Represented a telecommunications connector manufacturer in the successful prosecution of a patent infringement lawsuit related to suppression of electrical cross-talk in connectors. Mike obtained summary judgment of infringement resulting in a favorable settlement. Imonex v. Greenwald Industries (E.D. TX) Represented a manufacturer of coin sorters in patent infringement defense in Eastern District of Texas with alleged multi-million dollar damages, resulting in dismissal of case and license of accused patents with nominal payment. Aearo Company and Cabot Safety Intermediate Corporation v. Apothecary Products, Inc. (S. D. IN) Represented trade dress owner of “pillow pack” packaging in infringement litigation and defense of cancellation action based upon alleged functionality of mark. We ultimately obtained a favorable license and dismissal of the cancellation action. Kaman Music Corporation v. Gibson Guitar Corporation (Dist. CT) Represented plaintiff in preliminary injunction motion and litigation asserting trademark infringement for defendant’s use of the “LP” mark. The case resulted in an agreement to discontinue the offending use. Thomas & Betts Corp. v. Siemon Company (W.D. TN) Represented a telecommunications connector manufacturer in the successful defense of a patent infringement lawsuit relating to printed circuit board designs with asserted damages in the millions of dollars. Our aggressive invalidity defense resulted in license of accused patents with nominal payment. B.A.S. Industries, LLC v. Indian Industries, Inc., (Dist. CT) Represented a distributor of table tennis equipment in litigation against the owner of the registered trademark “ping pong”. We filed a cancellation action based upon the asserted generic status of the mark. The case resulted in a favorable settlement for our client. Four of Cantor Colburn’s key partner were selected by their peers for recognition in The Best Lawyers in America (2019 Edition). Co-Managing Partners Michael A. Cantor and Philmore H. Colburn II, Litigation Department Chair Michael J. Rye, and Partner and Trademark & Copyright Department Chair Curtis Krechevsky were recognized for the third consecutive year.